Omikushi or Omikuji, means “fortune slip” in Japanese. The idea came from the concept of fortune cookies that have messages on the inside. These messages tend to be boring and cliché. I decided to change this and make cuddly furry stuffed animals that carry messages on the inside with a cruel sense of humor. Instead of giving your friends common greeting cards you can give them an Omikushi that they will keep forever! Omikushi comes in 10 different categories: birthday, congratulations, thinking of you, friendship, apology, encouragement, get well soon, thank you, graduation, seasonal and flirting. 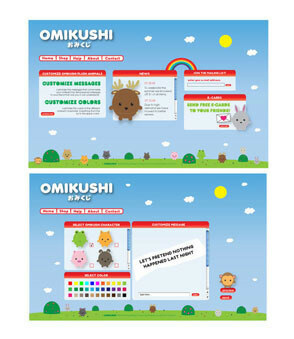 In the website, users can customize the message that the Omikushi will have in the inside.